Most people are skeptical when they hear about decanting their wine with an aerator. Seriously, how can a gadget change the taste of wine? Now, before you look at an aerator as some magical contraption that‘s hardly worth the investment, ask yourself this; do you toast the bread to make your sandwiches tastier? Do you wait for fruit to ripen? 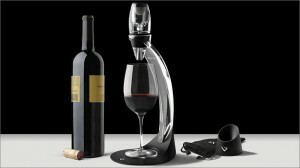 If so, then you should also decant your wine or aerate it with a wine aerator. I’m sure you’ve heard that decanting a bottle of wine by pouring it into a wine decanter and waiting for a few hours will make wine taste better. This process allows the wine to breathe. When wine breathes it mixes with air causing the wine to open with aromas. The initial aromas of a freshly uncorked bottle of wine can be stale. Some people call this bottle stink. 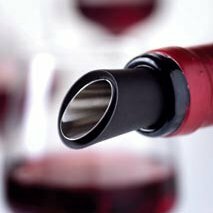 Allowing the wine to breathe eliminates the aroma; which also improves the wine’s flavor by greatly softening the tannins. The reduction of tannins creates a smoother glass of wine. A wine aerator is similar to decanting wine, but better for those of us who don‘t have time to wait for decanting. 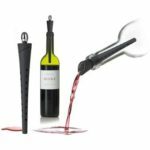 This innovative wine gadget speeds up the aeration process in decanting wine instantly; thereby, improving the taste of a youthful wine even more quickly than a decanter. The feedback we receive on these products is amazing. Just the other day a customer called to order more for holiday gifts and said, “it actually works very, very well!”. So, try one today. Conduct a taste test between a glass of wine poured through an aerator and one that isn‘t. You’ll notice the distinction between the flavors. 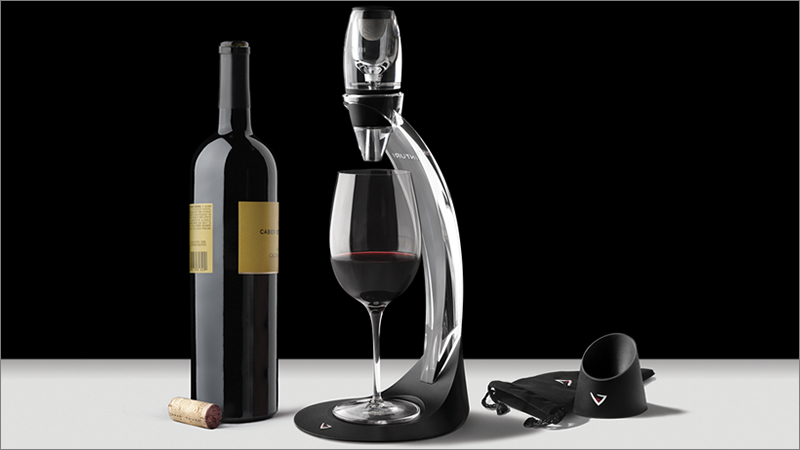 Cooks Illustrated reviewed both the Nuance Wine Finer and the Vinturi Wine Aerator. A blind taste test produced high recommendations for both wine aerators. Nuance Wine Finer said this about their product, “tasters unanimously agreed that our aerator stood out for markedly improving flavor and aroma, increasing fruitiness, opening up the wine’s bouquet, and smoothing harsh notes.” Both innovative wine aerators will change a sip of wine into a more enjoyable tasting. Watch this video of how the nuance wine finer works. Be sure to order your Vinturi Tower early this holiday season. It’s been a popular product that has been difficult to keep on our shelves. Wine tasting parties are becoming more and more common these days as a great way for friends to get together, have fun and learn about wines. Usually each guest will bring a different bottle of wine to the party. 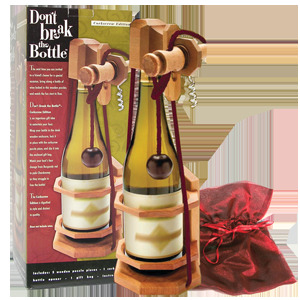 Why not be the talk of the party and put your bottle of wine in a wooden contraption called a bottle puzzle? Start the wine tasting party off to figuring out how to get the bottle of wine out of the puzzle. Conversation and wine will flow, but only if you solve the puzzle! If you’re planning on hosting a wine tasting party, you’ll need a theme. Select a varietal from a specific region or regions then invite guests to bring California Whites, California Reds, Italian Reds, European Reds, etc. Our sales have covered many different wine tasting and wine trivia games over the years. Here are some of our most popular versions. 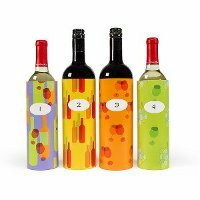 This wine tasting kit can accommodate a party of 36 wine lovers. 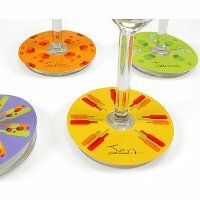 It comes with 24 colorful wine bottle wraps and 36 wine glass stem tags as portrayed in the following photos. This Wine Tasting Game goes above and beyond other wine tasting game kits since it includes an aroma guide, tasting tips booklet and flavor guide. 900 questions are divided into 6 categories which are Area, Chateau/Producer, Spirits, Vocabulary, Fortified Wine and Grape in Bouquet The Wine Game. Do you find AC Pomerol in Spain? A small Spanish district producing highly concentrated wines of Garnacha and Carinena is taking the world by storm. Name the district and the region. Which is the most peaty / smoky whisky – Irish or Scotch? Is a vintner a wine merchant or a person who grows grapes? How soon must a Port be bottled after having been declared as a Vintage Port? The Barolo, Barbaresco and Gattinara wines are all made from one grape variety. Which? Our next best seller, the Winerd Board Game, uses three bottles of red or white wine. 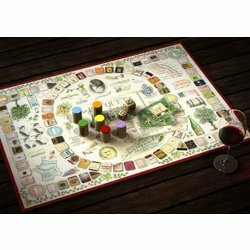 This wine board game has 300 wine trivia questions and includes blind tastings for evaluations. You should do this to make sure that the cork is moist and not crumbly which could indicate improper storage and possible spoilage. If you choose to smell it, you will most likely only smell a wine scented cork unless there is a severe defect. A poker-sized card deck featuring 52 different white wine grapes. Each card describes a specific grape, outlining its origins and characteristics, along with a suggested dish to serve. Learn what grapes are included in popular blended wines—French Bordelais, or Chateauneuf du Pape; Spanish Riojas, and Italian Vino da Tavolas. Not only do I drink wine, but I also own a building company (and no… I don’t mix them). 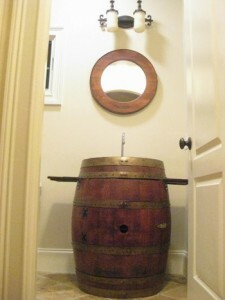 But I have installed the Wine Barrel Sink furniture piece in a bathroom before. It looks fantastic! I set it on stone tile from Turkey which compliments the finished barrel tones. I even personalized the Cask & Crown Mirror, with the year the house was built, and hung if over the sink. Doesn’t it look great? 1.) Measure your door opening. Make sure the wine barrel sink can fit through the door opening. If the door opening is too small, check with your trim carpenter and see if the door casing can be removed to squeeze the barrel into the room. If you are building a new house and plan to put the barrel sink through a tight doorway, order the Wine Barrel Sink furniture piece early. This way you can put it inside the room during framing. Once your framing inspection is approved and plumbers are on-site; they will ask for rough-in plumbing location for your Wine Barrel Sink furniture piece. I ordered it early. So, they had it on-site to figure out the measurements. You can wait and order your Wine Barrel Sink furniture piece for final trim out. If you decide to wait, let your plumber know the valves will be located in a 5” area that is 17” – 22” off the finished level of floor (meaning measure from the top of tile or wood floor). I suggest you hire a trim carpenter to complete the barrel modifications. Note the manufacturer’s opening for plumbing connection to sink is too small. You’ll need to widen the opening to fit the plumbing. Once the barrel is at your job site have your trim carpenter measure locations and compare to opening in back of barrel. Cut barrel as needed to fit your plumbing. You’ll also need to cut the barrel’s inside shelf to accommodate the pipe. Last thing you have to do is enjoy this great wine barrel sink for years to come!